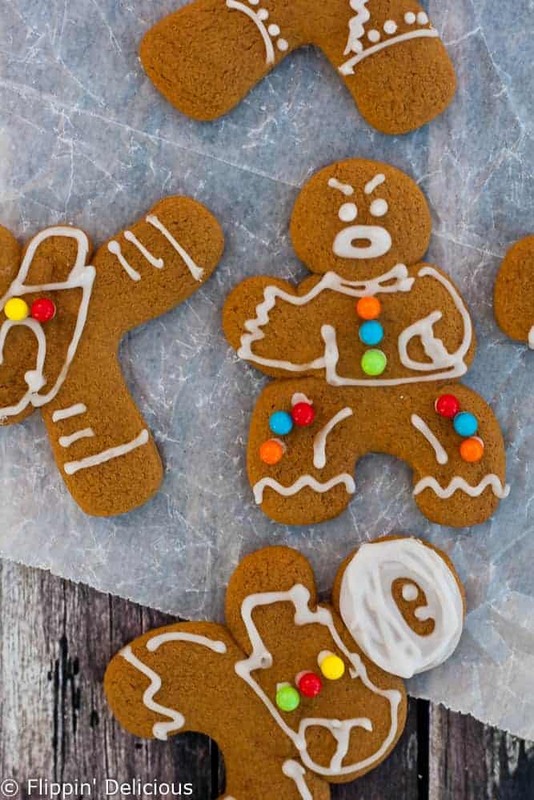 Gluten free vegan Ninjabread Men made with an easy gluten free, dairy free, egg free, gingerbread cut out recipe are a fun treat that the whole family can enjoy during the holidays. I have been DYING to make some cute little gluten free ninjabread men since I saw these cookie cutters on Amazon a year or two ago. Plain gingerbread men are still ultra cute and definitely a family tradition, but little ninja gingerbread men?!? I have some little brothers who are all over this kind of stuff. And they are just plain fun. I finally folded, and bought some ninjabread men cookie cutters to make these super cool gluten free vegan ninjabread men cookies as a part of this gluten free cookie exchange and giveaway (don’t miss the recipes or the giveaway after the recipe in this post.) I think the cookie cutters were worth the investment! I started this baking project like I do many others. With a fussy baby on my hip, trying to finish using the mixer before I put her down for her nap. Rushed. Tired. Luckily I didn’t make any mistakes EXCEPT that I was planning to make the gluten free ninjabread men cookie dough vegan also. I was just making a few changes to the gingerbread cutout recipe in The Essential Gluten-Free Cookie Guide. I was already using shortening, but I needed to use a flax egg instead of the chicken egg that I normally use. As soon as the yolk hit the bottom of the bowl I realized my mistake. So I hurried and finished making the cookie dough, put it in the fridge to chill, and then put Baby T down for her nap. Then I made another batch of cookie dough, this time using the flax egg like I had planned too. I can’t complain too much, I just got double the gluten free ninjabread men out of it. To keep my ninjabread men vegan, I used an egg-free royal icing to decorate them. It really is just powdered sugar with the tiniest bit of water mixed it. It worked perfectly! Just be careful to not add too much water. If you do the frosting will run all over the place. When I first started decorating them I was rushed. I could tell the baby was starting to wake up from her nap, and I had to pick Miss E up from preschool very soon. The first dozen cookies looked terrible! If you follow me on snapchat (@flippindelish) you got a peek at my cookie decorating adventures. If you don’t follow me on snapchat, you’ll just have to take my word on it. The first cookies were ugly. I wasn’t entirely satisfied in my abilities to decorate the cookies I took pictures of either but I decided this gluten free vegan ninjabread men recipe is just about making something that the whole family can enjoy together. It was just about having fun! By the end of it I was having a blast, even decorating a few cookies in the likeness of some of my favorite Doctor Who characters. 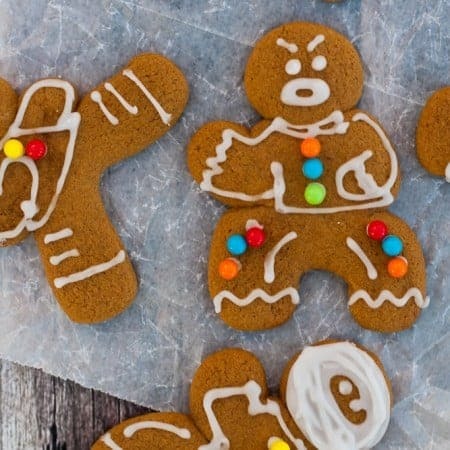 So bake up a batch of these gluten free vegan ninjabread men and decorate them with your friends and family this holiday. 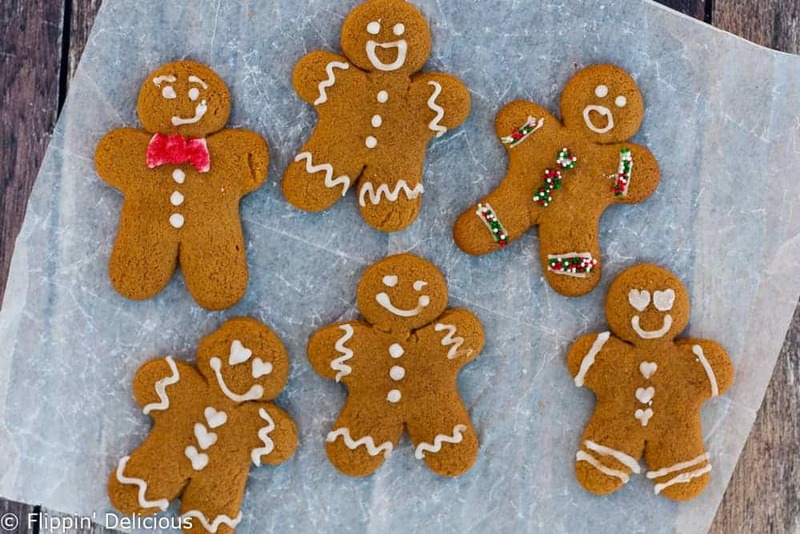 Are you looking for paleo or grain free gingerbread men? Check out my friend Taylor’s Paleo Healthy Gingerbread Cookies. In a small bowl mix together the ground flax seed with 3 tablespoons of hot water. Set aside and let sit for at least 5 minutes. This is your flax egg. Cream together the brown sugar and shortening. Add the flax egg and molasses and mix until smooth. Split the dough in half. Form each half into a disk and wrap in plastic wrap. Chill for at least an hour, up to several days. When you are ready to bake your cookies preheat the oven to 350F. Line a baking sheet with parchment paper or a silicone baking mat. Roll the dough about ¼ inch thick and cut out with ninjabread men cookie cutters, or gingerbread people cookie cutters. Place the cut outs on your prepared baking sheet , about and inch apart, and bake for 8-10 minutes. (8 for a chewier cookie, 10 for a crisper cookie.) The cookies will still be very soft when you remove them from the oven but will have lost their "doughy shine". They will set up as they cool. Mix the powdered sugar and water together, about a teaspoon at a time, until you get a very thick but smooth icing. Scoop into a decorating bag or sandwich bag with a tiny bit snipped off of the corner. Decorate your cookies as desired with icing and any desired sprinkles or candies. If you use this cookie dough to make your gingerbread houses, bake the cookies for a few minutes longer so that they are extra crisp. The length of time will depend on how big your pieces are. The Caramel Bliss D’Lites are my favorite! I also was super impressed with the Whey & Quinoa Protein Powder. I have been looking for a safe protein powder that still tastes good, and I have finally found it. I mixed mine up with just milk, and even my sometimes picky husband really liked it. 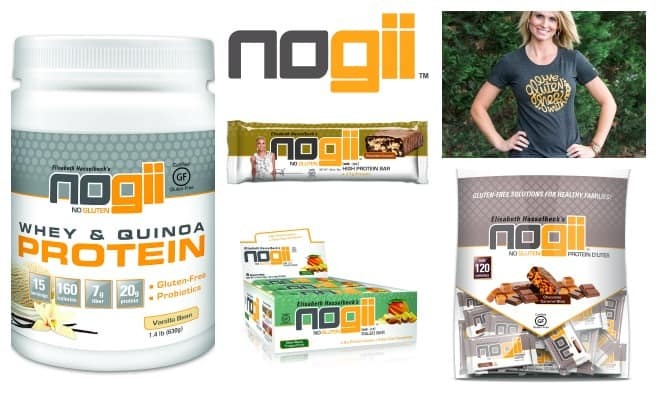 Normally I feel like I have to blend protein powder up with fruit and ice cubes to make it “palatable.” That was not the case with NoGii’s protein powder. 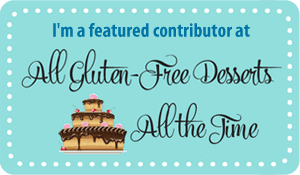 I’m also giving away a signed copy of my cookbook, The Essential Gluten-Free Cookie Guide. 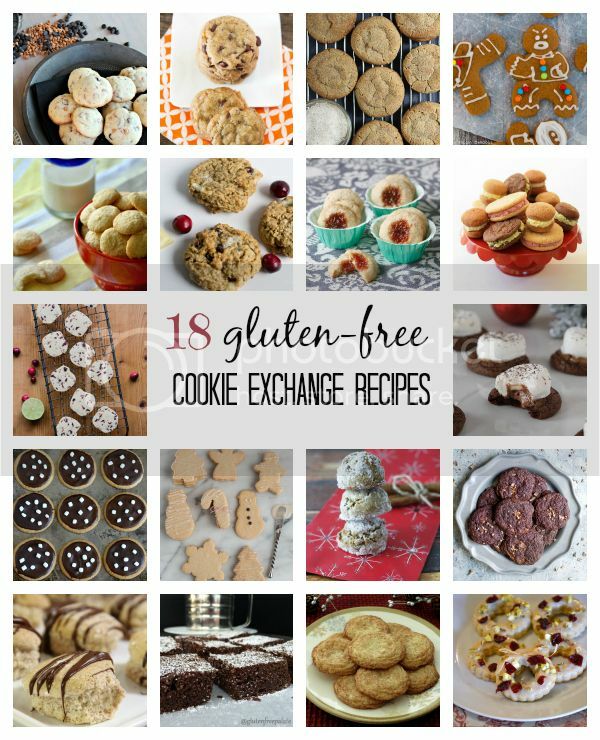 It is full of cookie recipes, including the not-vegan version of these cookies. 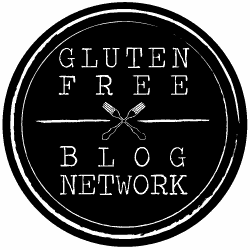 Be sure to check out the NoGii blog, it is full of information, tips, and gluten-free recipes. You can also find them on Instagram, Facebook, and Twitter! ADORABLE! I love how you’ve decorated these cute little guys! You’ve inspired me to do a better job of decorating my gingerbread men … and now I have to go make some more! Thanks Jules! I think I’m happy with how they turned out after all. I was being WAY too hard on myself. Of course they didn’t look just like the photo on the box! These look awesome! My boys would LOVE ninja cookies! Thanks Cindy! I am going to have to make them again for my brothers. They are big into Ninjago, so I think they’d love them. Brianna, those cookies are adorable!! Thanks Colette! They were a lot of fun. These are so cute! I have those same cookie cutters and made Ninjabread cookies for my son’s bday last year but they weren’t gf. I’m excited to try your recipe! Thanks Lacy! I thought the cutters were so fun. Oh my word! 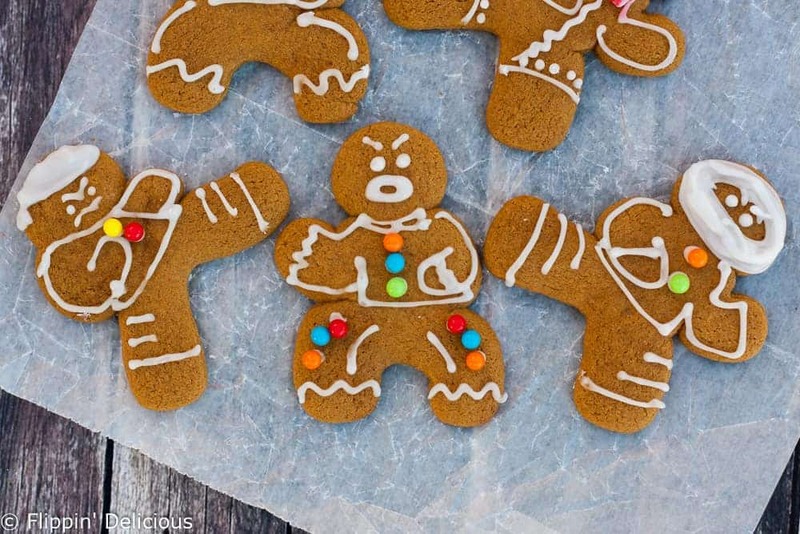 How cute are these Ninjabread men! This is so clever! I have a four year old cousin who would LOVE these! Thanks Annie! My daughters loved them too. SO in love! They are so cute and I love gingerbread men! I LOVE THESE COOKIES!! They’re way too adorable! And how did you make the individual images clickable in the collage? Love that idea. Thanks Sharon! I used a free online image mapper to make the clickable collage. It isn’t too tricky! These are so cute you had me laughing out loud! Love them! Those are so freakin’ cute! I’m going to have to look for those cookie cutters and those cookies … they look so perfect! Thanks Alisa! I thought they were really fun. These are so cute! I love them, I’m sure they are hit with kids and adults! Everyone has loved them so far! Thanks Elise! They are so fun and festive. My kids have been freaking out about ninjabread cookie cutters. I’m going to surprise them and make these this week. Your cookie recipes are always SO AMAZING! Thanks Lindsey! I’m sure they will love them. I brought some to my daughter’s preschool. Definitely a huge hit!